Is your audio interface fast enough? No-one wants to travel in the digital slow lane. So how important is the speed of your audio interface? I'm confused about audio interfaces. Should I get one that uses USB or FireWire? Or maybe I should consider a Thunderbolt interface. Can you advise? At the risk of sounding like a scratched record I'll say (yet) again that no-one cares what software or equipment you use; they only care about what your work sounds like. That applies to both industry clients and the general public. There is no difference in the sound of audio interface standards such as USB, FireWire and Thunderbolt, but there are differences that might affect your workflow. And having a smooth work flow can only be of benefit to your end product. There is also FireWire 800 which, as you might guess, is twice as fast as FireWire 400 and therefore represents more of an advance on USB 2.0. At the time of writing, it does seem that FireWire is reaching the end of the road. As evidence for this, take a look at the latest Apple Macintosh computers. FireWire port? No. This doesn't mean that you can't use FireWire if you want to. You can install a PCIe FireWire card in a desktop computer, or use an adapter with your new Mac. If you have your eye on a particular audio interface that has all the facilities and functions you need, but uses FireWire, then as long as your computer can handle FireWire by whatever means there is no reason why you shouldn't buy it and use it happily for the next two or three years, or as long as you like. As exciting as it might seem, USB 3.0 might just not be the future of audio interfaces. Of course it is faster than USB 2.0, but only in the sense that it can carry more data traffic and therefore more channels. It doesn't get the data there any quicker so there is no advantage in latency over USB 2.0. For general computer use the higher bandwidth of USB 3.0 is great, but for we specialized audio users it's a bit of a disappointment. The tiny number of USB 3.0 audio interfaces that are available seems to support this conclusion. You don't have to read far into the online literature on computer connectivity to see that Thunderbolt is the 'next big thing'. One way to think of Thunderbolt is as a direct connection to your computer's motherboard. So there's nothing to get in the way of multiple channels of audio and very short latency times. Where USB 2.0 is capable of 480 Mb/s and USB 3.0 5 Gb/s (5000 Mb/s) Thunderbolt 2.0 can achieve an amazing data transfer rate of 20 Gb/s. Due to its direct connection through to the heart of the computer, Thunderbolt 2.0 offers significant advantages in latency over USB and FireWire. This, to the home studio owner, is likely to be its greatest advantage rather than the possibility of vast numbers of channels. One small complication is that Thunderbolt 2.0 already seems to be giving way to Thunderbolt 3.0, which is twice as fast at 40 Gb/s. It uses a different connector than Thunderbolt 2.0, but it is backwards compatible with Thunderbolt 2.0 using an adapter. Whether to choose a Thunderbolt 2.0 audio interface now or wait until Thunderbolt 3.0 interfaces are commonly available is a good question. I'd say that if you need it now and it will help your working process, then buy Thunderbolt 2.0 now. Procrastination has killed far more potential hit songs than any mis-bought item of equipment, software or connection type. What we have learned so far is that modern methods of data connection offer more channels and less latency. But there is another important thing to consider - how much power they can deliver. We have been sending power along microphone cables since phantom power was invented in the 1960s. USB can transmit electrical power too - a useful 500 milliamps at 5 volts, equating to 2.5 watts. USB 3.0 ups this to 4.5 watts. Thunderbolt ups this much further to 10 watts, and Thunderbolt 3.0 can apparently deliver up to 100 watts, which should prove very useful in the future, although it will depend on the device's manufacturer to specify the exact maximum. With so many watts to spare, there will be no question that there is enough power to supply all of your capacitor microphoneswith as much power as they want and to drive your headphones as loud as you like. The simple conclusion is that USB 2.0 is the present about to become the past. FireWire 400 and 800 definitely seem to be slipping into the past, and Thunderbolt 2.0 is the present and the near future. Thunderbolt 3.0 will probably be the future, but we'll have to see how that works out. So if you are about to completely re-equip with a new computer and audio interface, there seems no reason not to go the Thunderbolt 2.0 route. But if your computer only has USB, then buy a USB 2.0 interface and you will still make great music. 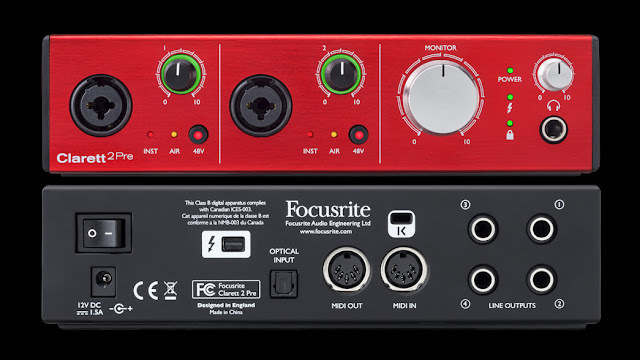 The interface shown in the photo above is the Focusrite Clarett 2Pre Thunderbolt interface.